Tavern on the Green will re-open Friday as a visitors center and gift shop, with food trucks parked in the terrace area. UPPER WEST SIDE — A bid to sell hard booze at a fancy food truck outside Tavern on the Green has some residents worried. Community Board 7 members say selling beer, wine and spirits out of the trucks could lead to under-age drinking and people wandering the streets with liquor in hand. “If somebody wants to enjoy a coffee with a shot of Bailey’s in it, we have to be able to serve that,” Burak Karacam, owner of Pera, one of four food trucks that will open for business Friday on the Tavern’s terrace, told Community Board 7’s business and consumer issues committee Wednesday night. 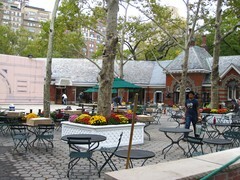 The city is still looking for a restaurateur to take over the Tavern on the Green space, but in the meantime the Parks Department is contracting with Pera, Ladle of Love, Van Leeuwen Artisan Ice Cream and Rickshaw Dumpling Truck to peddle high-end treats outside the Tavern.